England’s Justin Rose has birdied the final hole at the Turkish Airlines Open to secure back-to-back wins on the European Tour for the first time in his career. Rose and his playing partner Nicolas Colsaerts arrived at the 18th tee tied on 17-under at Regnum Carya Golf & Spa Resort with both players putting their approach shots within a few metres of the hole. 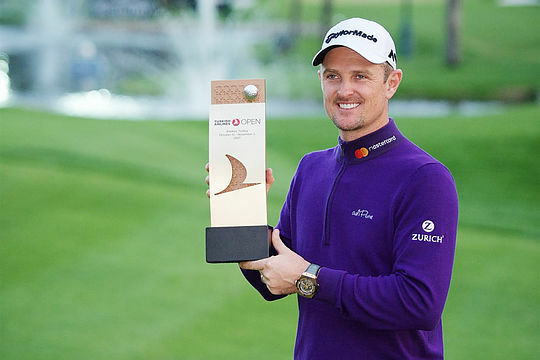 However it was Rose who prevailed with a birdie to close out the tournament with a final round 65 at 18-under for this tenth European Tour title. Rose now moves within just 135,000 points of Tommy Fleetwood in the Race to Dubai Rankings and some 800,000 ahead of third-placed Sergio Garcia. His win places him in the perfect position to secure his second European Tour Order of Merit victory after first claiming the title a decade ago in 2007. South Africa’s Dylan Frittelli finished tied with Colsaerts at 17 under following a 64 with three-time major winner Padraig Harrington another shot back at 16-under and in outright 4th. Rose joins Tiger Woods and Rory McIlroy as only the third player to follow up a WGC win with another victory the following week. Andrew Dodt and Scott Hend took the top honours for the Aussies this week in equal 42nd place with Sam Brazel another two shots back in a share of 52nd place. Marcus Fraser closed in a tie for 66th at 4-over. The European Tour now moves to South Africa for the penultimate $7,500,000 Nedbank Golf Challenge before the season-ending DP World Tour Championship in Dubai from November 16th.